Upgraded walkway planned after increase in number of visitors to the Glenfinnan Viaduct. A walkway is being upgraded to allow better views of the famous Glenfinnan Viaduct, which features in the Harry Potter films. The number of people travelling on the Highlands line has doubled in the last decade, according to the Office of Rail Regulation. The walkway that crosses the hillside between the railway station and the viaduct will be upgraded to provide easier access to several new viewing areas, allowing tourists to capture the stunning scenery. 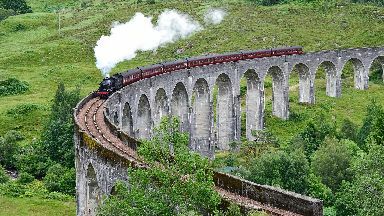 Skye, Lochaber and Badenoch, MSP Kate Forbes, said: "It's fantastic to see more people choosing to go on the 'Harry Potter line' and experience the fantastic scenery at the Glenfinnan Viaduct, as well as the breathtaking views from Fort William to Mallaig generally. "Ultimately, I would like to see more people using public transport instead of driving as it reduces congestion and its good for the environment."